It’s been exactly a year since my first time cycling Parenzana. 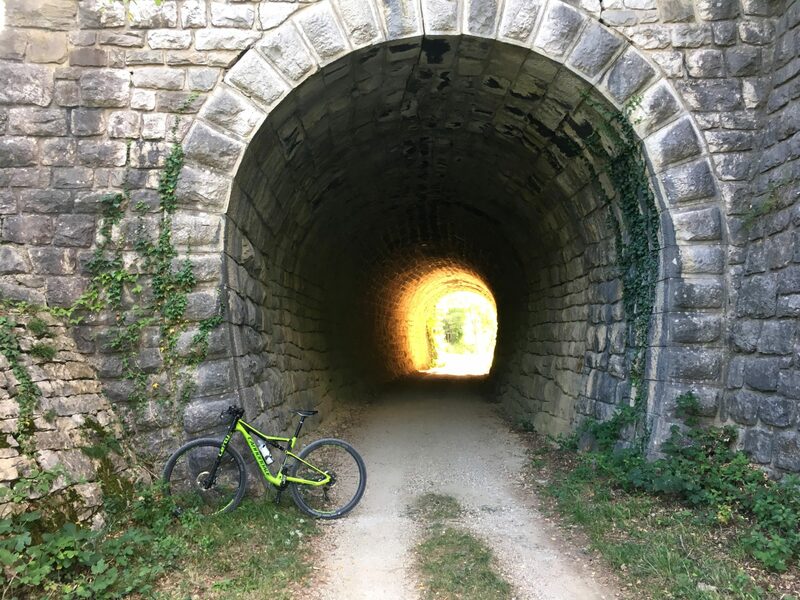 Last September my husband and I got a tip from a friend about the 123 km (76.5 miles) ex-railroad, now a regulated cycling path, connecting Trieste with Poreč, and decided to give it a try. 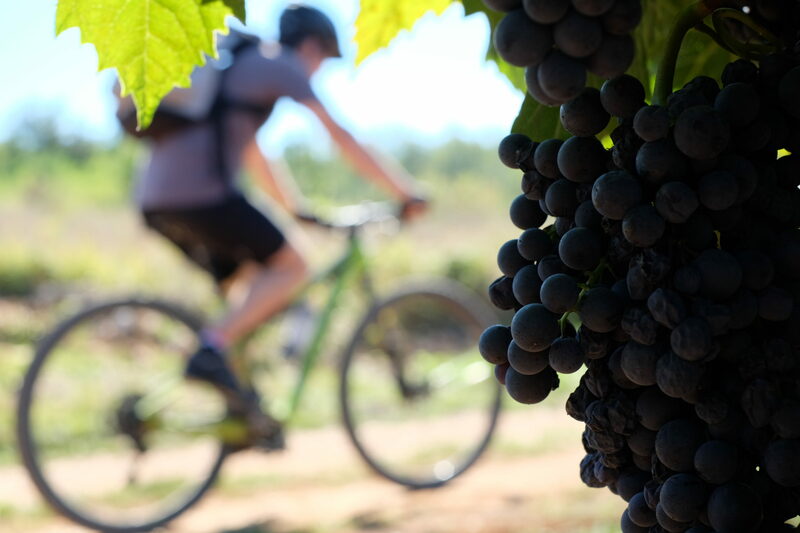 After a romantic weekend cycling in the midst of unspoiled Istrian nature, eating truffles and freshly picked grapes, we both agreed to turn this trip into a yearly thing. 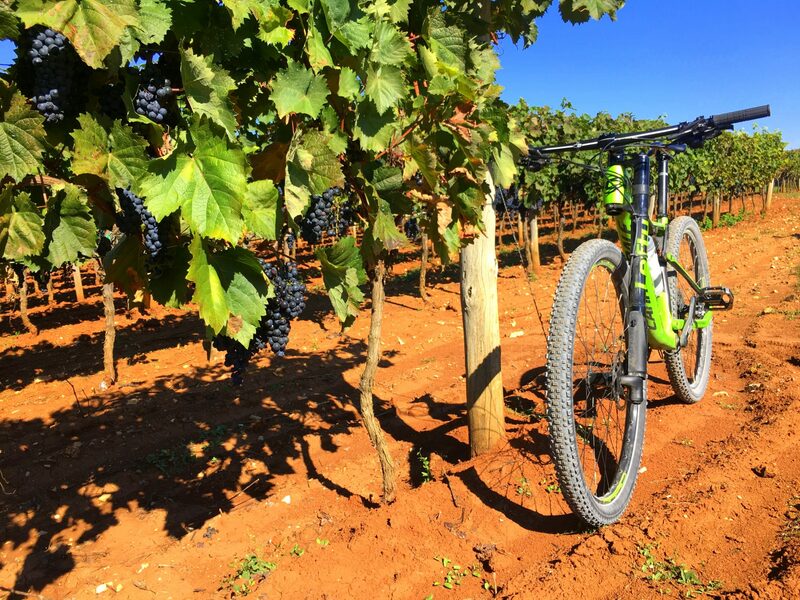 We returned to Parenzana last weekend, fueled with high expectations and unusually high temperatures. 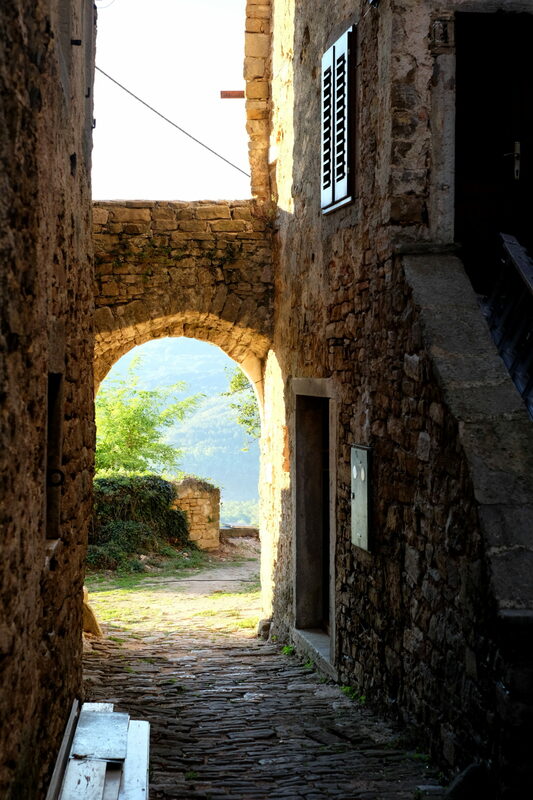 As you know, Parenzana starts in the Italian city Trieste, winds through the Slovenian coastline, then turns towards small green hills of the Istrian interior, and finally ends in the popular Croatian summer resort Poreč. Although there are several transport providers available for those not planning a full round tour, we went for a much simpler plan. 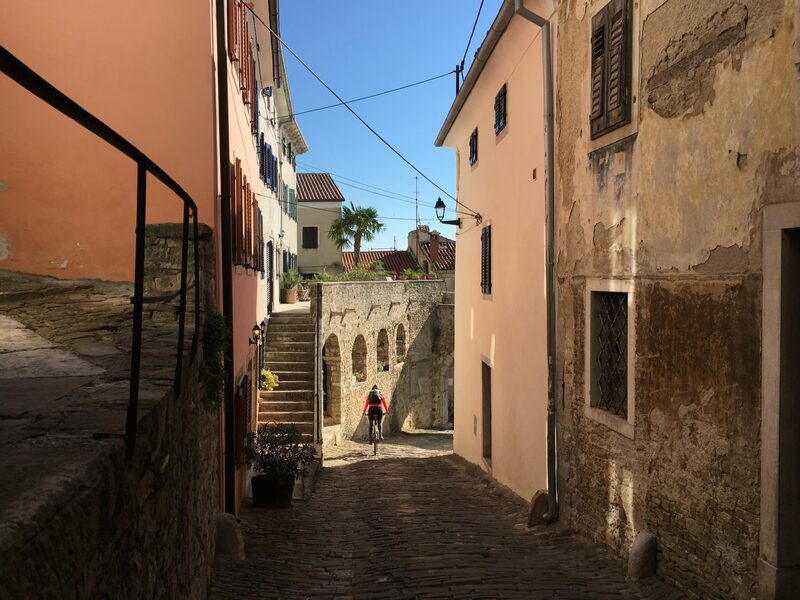 We parked our car in Umag, another Croatian summer resort, skipping the whole Italian and Slovenian part of Parenzana, and joined the famous trail at the rim of the Croatian part in a small town Buje. Our round cycling trip was supposed to add up to about 115 km or 71 miles, of which more than two thirds on gravel. Good enough. Why park in Umag and not in Buje instead? Trust me, after cycling 15 km (9.3 miles) on a busy road going mostly uphill and then passing cars parked at the beginning of the gravel Parenzana in Buje, I kept asking myself the same question. Did not make any sense at all at first. 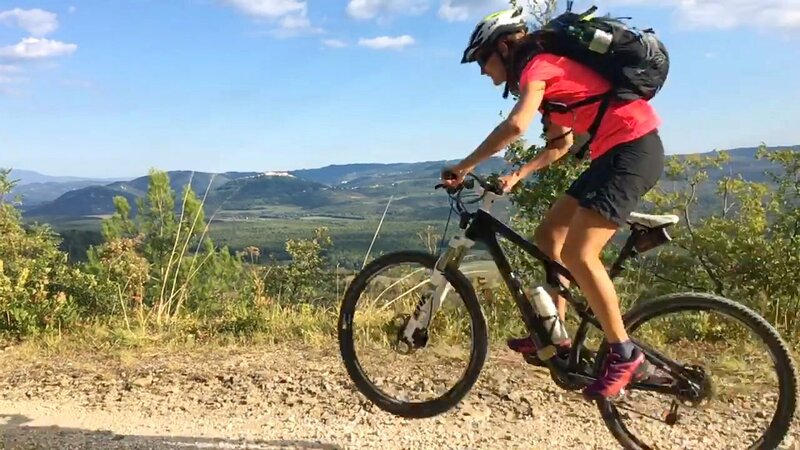 But then after 115 km and 1,000 m elevation, it dawned on me that an extra killer hour pushing pedals up the hill would be completely unnecessary at that point when it flew by so smoothly the day before with fresh legs and - most of all – beginner’s enthusiasm. Plus, more time for shopping in Poreč, indulging local foods and taking photos is always appreciated! Anyway, once on Parenzana, the world became nicer and quieter. There was us, the sweet sounds of chirping and tweeting, and those savory smells of Mediterranean herbs and shrubs I happily embraced. The first part from Buje to the next small settlement at the top of a hill, Grožnjan, sloped down a bit at first but then slowly started gaining altitude again, reaching the highest point of the whole trip at 310 m right there in Grožnjan. After this point, it was mostly fun going downhill. May I say, the trail was amazing and it was nearly impossible not to do jumps and other acrobatics. 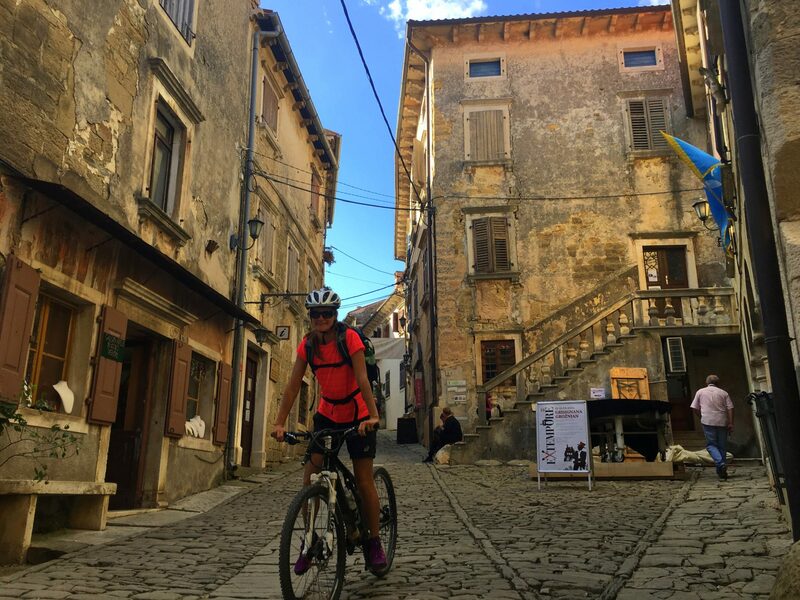 After a power lunch in Grožnjan, we saddled our bikes again and headed towards Motovun, yet another enchanting medieval settlement at the top of a hill, where we had booked a room for the night. We followed a gently descending winding road through a picturesque landscape with a series of bridges and short tunnels, until we reached a particularly long one which happened to have a warning sign at the entrance to switch on our light. You all, driving in a pitch dark tunnel was not exactly an activity that filled me with immense pleasure, but hey, better that than pushing the bike across a steep hill, right? I clutched to my bike with one hand while holding the phone with the other (thanks for the flashlight, I love you Apple! ), and pushed the pedals at a rather commendable pace even Eddy Merckx would be proud of. Lesson learned? Never ever forget my headlamp again! Other than the tunnel incident, the trail was amazing. 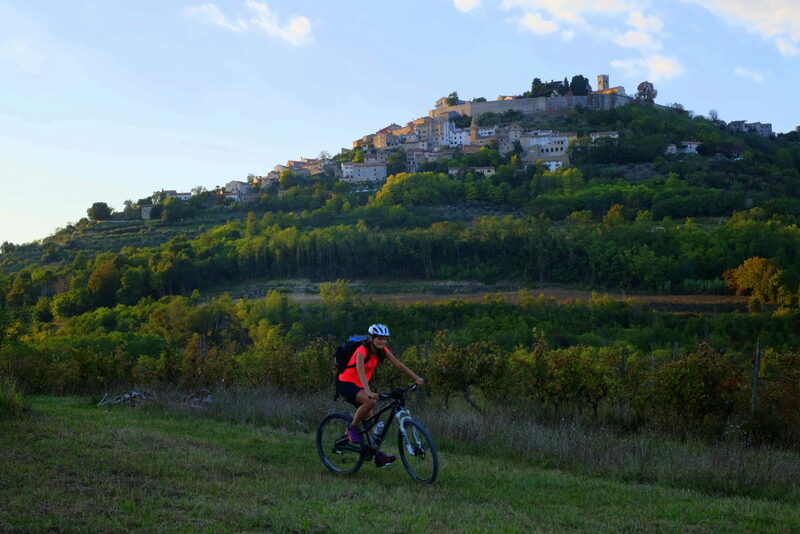 The very best thing about Parenzana is that its slope is never too steep, making the downhill a very long enjoyable experience and the uphill fairly easy as well. 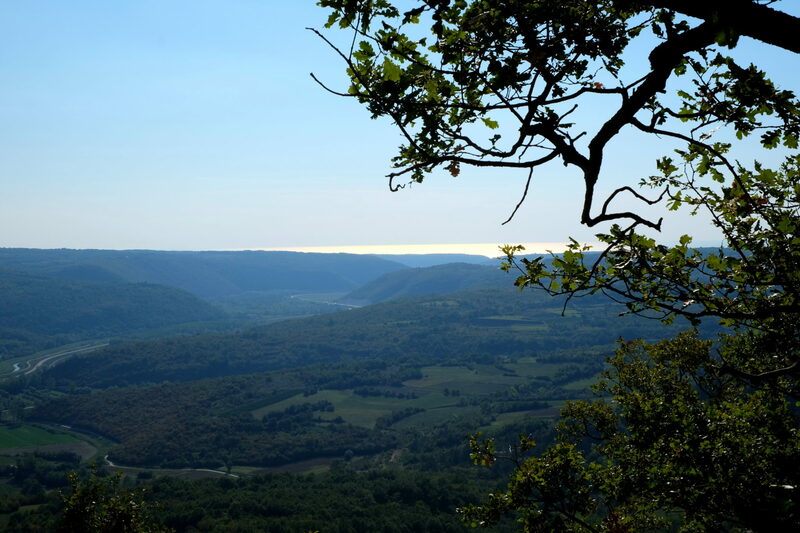 The 300 m descent from Grožnjan to Livade thus took us two hours; that’s two hours of sweet ninja cycling over mini jumps crafted in gravel, and stopping at viewpoints out of the forest to marvel at shining sea not too far away behind green rolling hills. The same as last year, the Livade town were hosting again the Zigante Truffles Days festival, an event we couldn’t just navigate by. 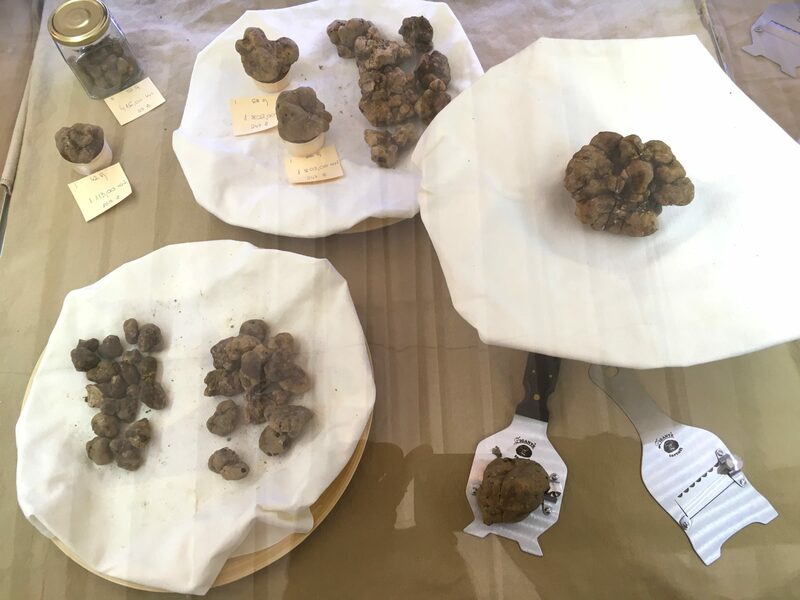 Since these small aphrodisiac fungi grow in abundance there in the old forest around Motovun, the locals brought all sorts of truffles enriched homemade goods to the festival; anything from goat cheese, salami, pasta, sauces, olive oil and truffles flavored marmalade, to truffles worth as much as 600 euros. After tasting a bit of everything, we bought as much goods as we could squeeze in our backpacks (I must confess to have cleaned a bottle of truffles-olive spread with buckwheat crackers while writing this… still licking my fingers… mmm so good!). Anyway, the festival is open until the end of October, so there is still plenty of time to visit. I will not publish a photo with me taking a huge bite of salami with truffles, I will not! But yeah, you get the picture. If you have a thing for truffles, this is an event you really shouldn’t miss! 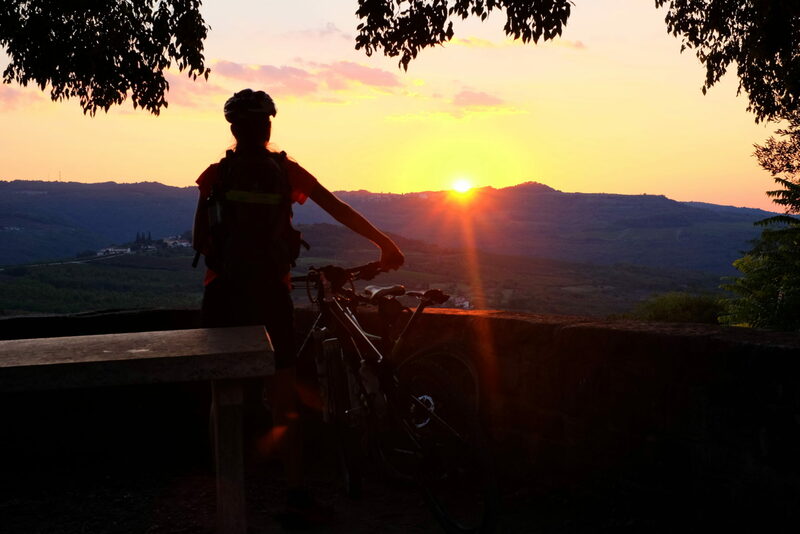 Although one could spend several hours inhaling all those yummy truffles goodies, it was actually high time to move on again towards Motovun in order to reach it before the dark. We picked up our pace and arrived fifteen minutes after the sunset. The rising sun next morning colored the misty fog in those warm orange shades I love so much. While my husband was still asleep, I crawled out of the room to explore the romantic little town. It seemed everyone was still asleep. Not that I’m complaining; I readily volunteered to get lost in the labyrinth of narrow old streets and the sun lit fortress completely alone. I could definitely get used to this view out of a bedroom window. 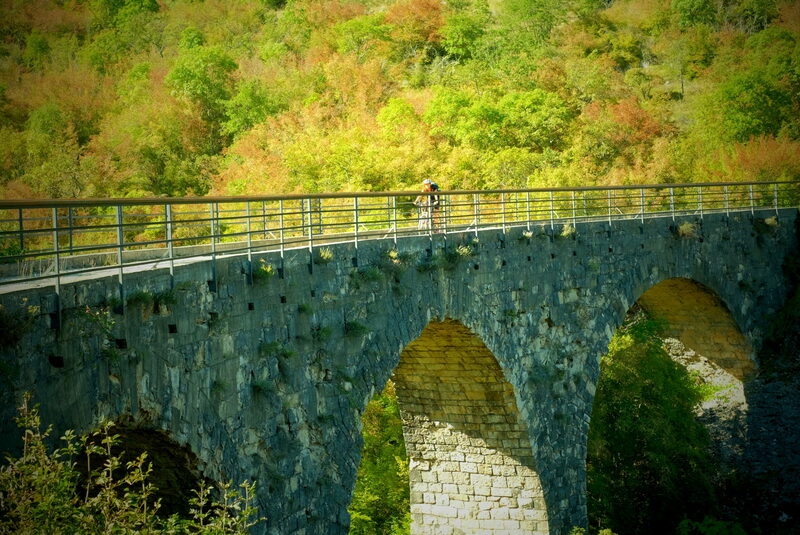 Knowing it was a long way ahead, we didn’t dally much in Motovun. After a big breakfast on a terrace (scrambled eggs with truffles – now, how about that?! 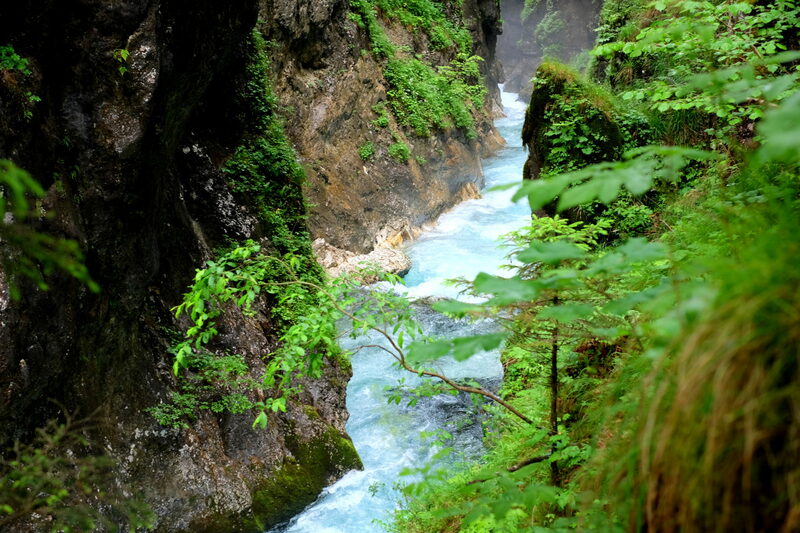 ), we were off towards Vižinada, the highest point that day, and then finally to our final goal – Poreč. 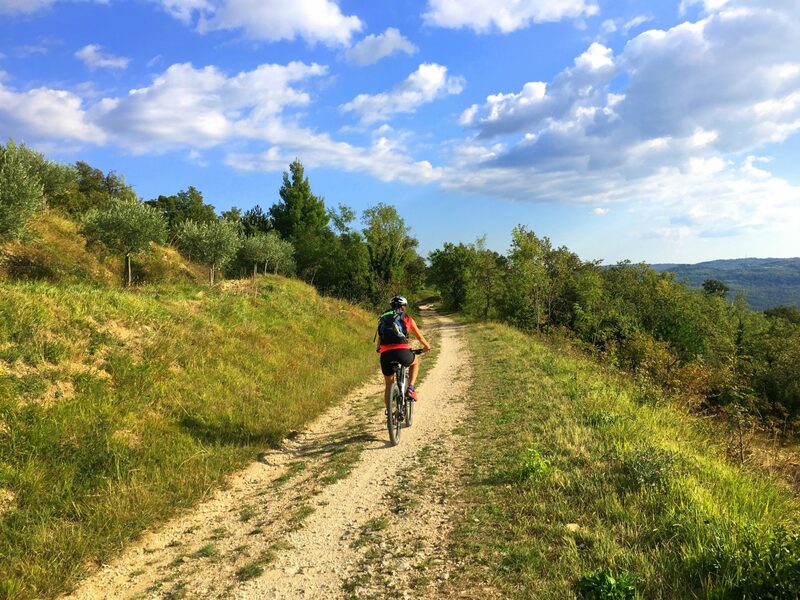 The trail from Grožnjan to Livade was very much alike the route to Poreč as it descended very slowly, only the landscape changed; from shrubs, truffles rich forests and gravel on the previous trail to countless vineyards, aromatic pine forests and Terra rossa on the following one. 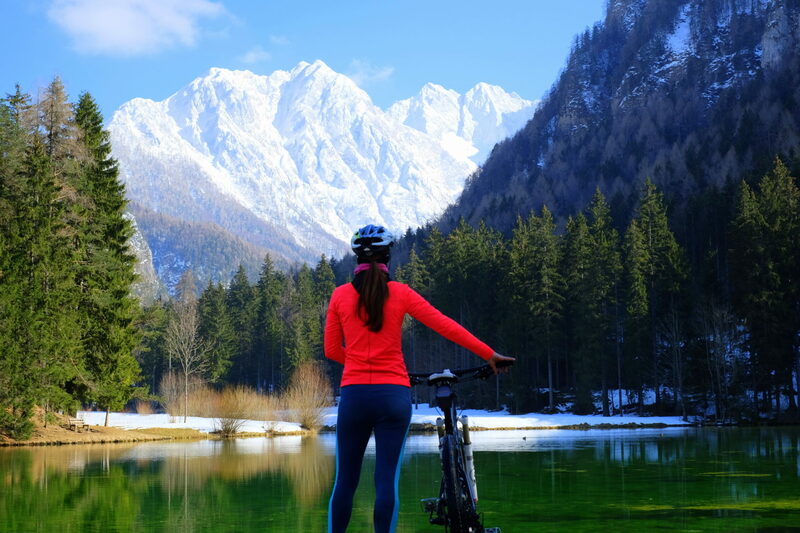 But compared to the first day, when we actually did the sweating part a few times, this section was nothing but enjoyable backcountry cycling. 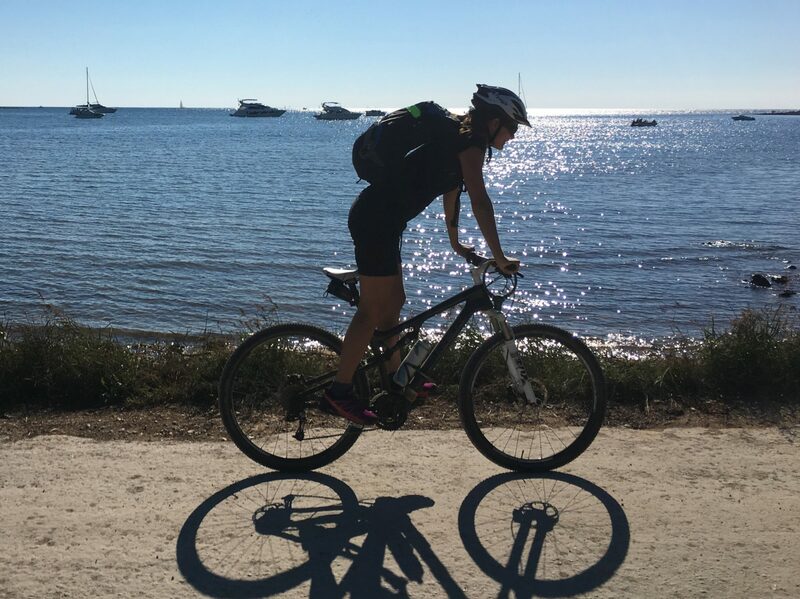 If Poreč came rather easy, the last part of our trip – cycling back to our car in Umag – was beyond stressful. Not the first six kilometers though. We found a perfect seaside backcountry trail marked as 142 which led us to Červar. But there the trail unfortunately ended and we were forced to cycle the last 25 kilometers on probably the busiest road in the whole of Istria with a continuous line of steep slopes. Needless to say, the first moment we caught a glimpse of our car could as well be the most joyful moment of the last couple of years. No joke. Nonetheless, we are definitely doing Parenzana again next year. And since it’ll be our first double digit wedding anniversary next year, the only right thing to do will be to take an extra day off and finally do the whole route. Can’t wait!